1. You’ve never been able to get the furniture arrangement to make sense in your living areas. *A home stager is an expert in furniture arrangement. They can tell you where to move the furniture, what to remove, what to bring in and how to maximize the space you are working with. They will make sure all the space you have is highlighted even if you live in a postage stamp studio. 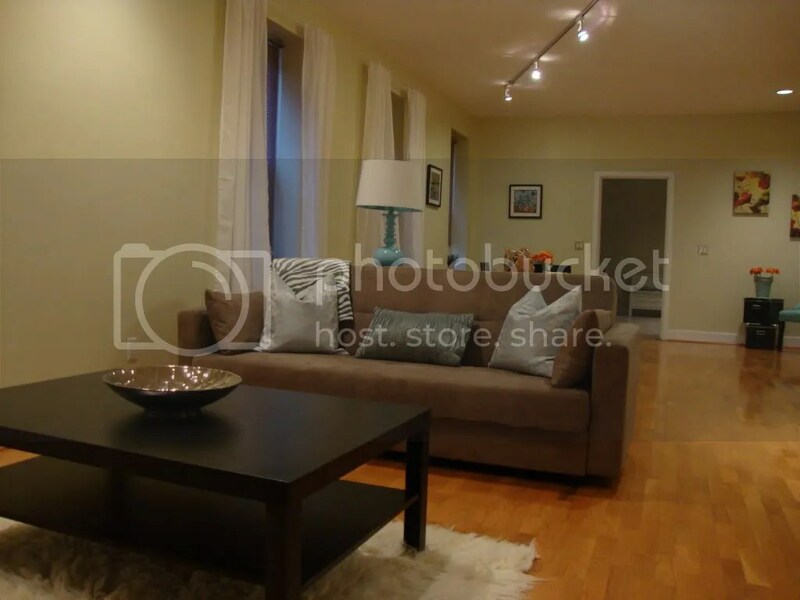 Check out this difficult space recently staged by Sunflower Creations. 2. Friends/family have referred to you as a ‘pack rat’ or collector of junk. *When you list your home it is no longer your “home” it’s a product. Removing all of the clutter (also called decluttering) is essential! A home stager will help you get organized and streamline the space so potential buyers can see the property and not your junk (er I mean valuables). 3. Your house still looks like you just moved in. Bare rooms with a splash of stark white walls. *This should be good right? Not really. A home should bring feelings of ‘comfort and joy’ not cold lifelessness. A home stager will help you choose warm neutral colors to paint the walls and will help you accessorize. 4. You want to get the maximum return on your home investment. *Staging is your number one marketing tool, use it. The average cost of a staging consultation is $200.00 and $1300.00 to stage a vacant home. That means a stager will work their magic and your home will sell faster without losing any equity. Staging before listing is the smartest thing you can do. 5. You are a workaholic and making time to get your home “buyer ready” isn’t on your list of priorities. *You work hard and that’s great! Let the stager handle everything. Stagers can coordinate contractors, painters and get your home staged so you don’t have to lift a finger. 6. You’re already living in your new home and the one pending sale is sitting vacant. *A vacant home really shows off the amount of space my home has, right? Not exactly. A vacant space can be intimidating to potential buyers. They need help picturing where they will put their furniture. A home stager will bring in all the furniture, decor and art necessary to make the property look picture perfect. 7. You just renovated a home and want to maximize on the investment, but again, it’s vacant. *While the renovation may be gorgeous a stager can bring in furniture so the property shows what its full potential is. After all that hard work you want to sell fast, right? 8. You want someone to walk you through the steps of staging and you want to do the work yourself. * You’re the DIY kind of person but you just need a push in the right direction. A home stager will typically do a consultation for $150-$300. They will do a full walk-thru of the home, tell you what should go, what should stay and how to rearrange. You will receive a full report with all of their recommendations and you are free to do the work yourself! 9. You know updating your kitchen will add value to your home but you want to make the right decisions to get the best return. *Stagers can tell you where to spend money on your kitchen so you get the best return. They can also help choose finishes and colors. 10. You think your home looks great but you want a second opinion from an expert. *Hiring a stager for a two hour consultation can help put you at ease. They will make recommendations on the best way to arrange furniture and repairs to make. Hope this helps those of you on the fence about home staging. View the 2010 RESA Staging statistics for the facts on how staging sells!